What a show! I need to add a lot more wrestler profiles but if I have one on the site, you can click on their name above to go to it. Please note that I don’t follow Tokyo Joshi Pro on a week to week basis, so I am not fully up to speed on their storylines. I’ll do my best but there may be some nuances that I miss. We kick off the show with the most veteran DDT Joshi wrestler. Cherry debuted for DDT back in 2004 and has been affiliated with the promotion since, but she has had championships in Ice Ribbon and WAVE so she has had success in many different Joshi promotions. Nodoka is a trainee of Cherry and had her first match exactly a year ago, so this is the classic “young trainee vs. veteran mentor” match that rarely goes well for the young trainee. They trade holds on the mat to start with neither getting a clear advantage, elbows by Nodoka and she goes back and forth on the ropes until Cherry trips her. Cherry picks up Nodoka and hits a scoop slam, footstomp by Cherry and she yanks on Nodoka’s arm. Mounted elbows by Cherry and she goes for an armbreaker, but Nodoka makes it into the ropes. Cherry picks up Nodoka but Nodoka elbows her and they trade shots, scoop slam by Nodoka and she hits a crossbody for two. Cherry goes for the cross armbreaker again but gets the seated armbar instead, but Nodoka gets a toe on the ropes for a break. Cherry picks up Nodoka and hits a double wrist armsault, but it gets two. Back up, they trade elbows until Nodoka hits a Samoan Drop, she goes off the ropes but Cherry knees her in the head before going back to the round. Spring Night Love by Cherry, and Nodoka has to submit! Cherry wins the match. Not a bad way to start off the show, although a bit one-sided. We knew that Cherry was winning of course but I wouldn’t have minded if Nodoka got a nearfall or two, she has been wrestling for a year so it wouldn’t have been too out of the realm of normal if she had a bit more offense than she got. On the plus side, Nodoka didn’t seem awkward or out of place, which is always nice to see in younger wrestlers. A lower end mentor vs. apprentice match, but not poorly worked. This was originally a tag team match, but Akane Miura pulled out due to illness so we got this match instead. Maho is a vampire demon, Hyper Misao is a super hero, and Rika Tatsumi is a much more normal submission wrestler. Also, Minami Momochi is at ringside (she is the ring announcer) and will likely get involved at some point. Hyper Misao sends Maho with her knees with garlic and a cross, but she uses the garlic on Rika too which gives Maho time to recover. Minami is still in the ring but hides in the corner, just as Maho gets to her she is rescued by Rika. Misao returns as well and they double team Maho, diving hip attack by Rika and Misao goes for the cover, but Rika breaks it up. Rika goes after Misao and puts her in a kneelock, Flashing Elbow by Rika but Maho breaks up the cover. Maho pounds on Misao, Misao is knocked out of the ring as Rika returns and she puts Maho in a figure four leglock. Maho gets into the ropes, Rika picks her up but Maho puts her in a sleeper. Maho bites Rika’s neck and hits a swinging neckbreaker, but Misao breaks up the pin. Maho puts Misao in a crab hold but Minami helps her get into the ropes, Maho knocks Minami into the ring but Rika comes in also, Misao comes in and tries to hit Maho but she hits Rika by accident. Maho goes back to Minami but Minami hits a neckbreaker drop, Misao goes up top and delivers the diving crossbody, but Maho rolls through it. Rika knocks Misao out of the ring before hitting a backbreaker onto Maho, she puts Maho in a sleeper before changing it to a Dragon Sleeper. Even vampires have to breath, so Maho submits! Rika Tatsumi is the winner. This was interesting. It was fun in a whimsical kind of way, which is what they were going for, I don’t think any of them are bad wrestlers but there was no way to tell from this match. Since Tokyo Joshi Pro is a brand of DDT there is going to be some matches that are comedy based, that is just part of the package. I would have liked to see more of what the wrestlers could do skill-wise, harmless fun but nothing more than that. Before you get the false idea that this will be a more serious match, Joey Ryan is the referee and Laura James is his wife. Plus Nonoko and Azusa are wedding-obsessed and bring a big Zexy Magazine with them to read and/or use as a weapon. Shimizu’s husband is also out by ringside so this is the dynamic we will be working with for this unique match. While Ryan is kissing his wife, Azusa and Nonoko attack their opponents, with Azusa staying in the ring with Shimizu. She knocks her over but Ryan isn’t paying any attention so he doesn’t count the cover. He finally does but counts really slow, giving Shimizu plenty of time to bridge out. Nonoko and Laura are tagged in, Nonoko distracts Ryan which makes Laura mad, but Nonoko shoulderblocks Laura over. Nonoko puts Laura in an abdominal stretch while distracting Ryan at the same time before tagging in Shimizu. Shimizu and Nonoko elbow Laura to the mat, but again Ryan does a slow count. Laura elbows Azusa and attacks her in the corner, giving her time to tag in Shimizu. Shimizu grabs Azusa’s arm and walks the ropes before hitting an armdrag, leg drop by Shimizu and she covers Azusa for two. Surfboard by Shimizu, she releases it after a moment and tags Laura back in. Scoop slam by Laura and she puts Azusa in a stretch hold, she goes for a Northern Lights Suplex but Azusa blocks it. Codebreaker by Azusa, and she makes the hot tag to Nonoko. Body blocks by Nonoko, she picks up Laura and hits a body avalanche in the corner before rubbing her chest in Laura’s face. I was trying to be PG but some things just have to be stated. Cover by Nonoko, but Ryan does a slow count which gives Laura time to kick out. Nonoko goes for the Boinmaker but Laura ducks it, Nonoko goes off the ropes but Laura connects with a hip attack. Nonoko and Laura both crawl to their corners and tags in, Shimizu elbows Azusa in the corner and hits a rolling fireman’s carry for a two count. Azusa regains control and pushes Ryan, she gets her Zexy Magazine but Shimizu ducks the attempt to use it. Nonoko comes in the ring but Shimizu’s husband runs in to protect her from being hit from the magazine, Ryan jumps in front of them but Laura then jumps in front of Ryan. Azusa goes to hit all of them with the magazine but they move, so she accidentally whacks Nonoko in the head. Laura puts a lollipop into Azusa’s mouth and kicks Azusa in the face, Fishergirl Suplex by Shimizu and she picks up the three count! Ai Shimizu and Laura James are your winners. This will be a more serious match, but it also has a brand new wrestler. Itoh is an idol singer that just had her first match three weeks ago, so needless to say she is a bit green. Reika just started wrestling last March but she is a powerhouse and is already pretty smooth in the ring. Reika is an idol singer as well, so its sorta singer vs. singer (although I think both are in pretty low-level groups). She was trained in the W-1 Academy so she has the basics down pat, she joined up with Tokyo Joshi Pro soon after debuting. Reika pushes Itoh into the ropes as the match begins but gives a clean break, they enter into a Test of Strength which Reika easily wins. Wristlock by Reika into a side headlock, but Itoh reverses it. Reika Irish whips out of it but Itoh hits a shoulderblock, running elbow by Reika in the corner and she kicks Itoh in the back and chest. Kick to the chest by Reika, she puts Itoh into the corner and kicks her repeatedly in the back. Reika picks up Itoh but Itoh puts her in a headlock, scoop slam by Itoh and she covers Reika for two. Itoh applies a crab hold but Reika crawls to the ropes to force the break, Itoh picks up Reika but Reika clubs her in the chest. Reika and Itoh trade shots, Reika wins the battle and she covers Itoh for a two count. Kicks to the chest by Reika but Itoh catches one and delivers a headbutt. Itoh goes off the ropes and dropkicks Reika, another dropkick by Itoh and she gets a count cover. Itoh goes off the ropes but Reika catches her with her own dropkick, vertical suplex by Reika and she gets a two count. Reika picks up Itoh and puts her in the Tower Bridge, and Itoh has no choice but to submit! The winner is Reika Saiki. 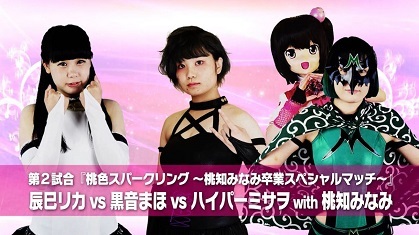 A match like this is the type that should be the opener, but Tokyo Joshi Pro in general is a very young promotion so sometimes rookie matches appear a bit higher up on the card. This was fine but very basic, when a scoop slam or a vertical suplex is a nearfall you know they aren’t doing anything too complicated. I think Reika has a solid base to become a good wrestler, it is just a bit too early to tell. Technically fine but nothing exciting. Anyone that follows me on Twitter knows of my recent infatuation with Mil Clown. I just love her, I think she does the character very well and is very entertaining. Mil Clown first appeared in September, when her “sister” Yuka Sakazaki stopped making appearances in the promotion. I’ll let you connect the dots. Last year, Candice defeated Yuka Sakazaki, so now Mil Clown is here to avenge her sister’s previous defeat. After trading holds to kick things off, Candice grabs Mil Clown by her tongue but lets go and apologizes. Wristlock by Candice but Mil Clown eventually kips out of it and springboards off the ropes before armdragging Candice. A heel kick by Mil Clown sends Candice out of the ring, Mil Clown goes to the ropes and hits a headscissors through them down to the floor. Mil Clown stomps on Candice at ringside and tries to slide Candice back in the ring, but Candice kicks her in the head. Candice sits Mil Clown down in a seat and kicks her in the chest, they return to the ring and Candice covers her for two. Mounted elbows by Candice and she yanks on Mil Clown’s arm before putting her in a choke submission, but Mil Clown gets to the ropes for the break. Back up, Mil Clown goes for a dropkick by Candice avoids it, Irish whip by Candice from the corner but Mil Clown boots her when she charges in and gets up on the turnbuckle. She cartwheels off when Candice charges in and connects with a dropkick, cover by Mil Clown but it gets a two count. Mil Clown applies a unique stretch hold but Candice gets out of it, she rolls Candice to the mat and applies an armbar. Mil Clown picks up Candice and elbows her in the corner, she goes for an Irish whip by Candice sends her back into the same corner before hitting a running elbow. She hits another one, swinging neckbreaker by Candice but Mil Clown kicks out of the cover. Candice goes for the Balls-Plex but Mil Clown blocks it and pokes her in the eyes, she then pushes the referee into Candice, and the blinded Candice thinks it is Mil Clown. She realizes her mistake but Mil Clown catches her with a jumping kick, scoop slam by Mil Clown and she goes for the swandive moonsault but Candice rolls out of the way. Candice goes for the Balls-Plex again but Mil Clown reverses it and slams Candice to the mat. She goes for the swandive moonsault again but Candice pushes the referee into her, Candice finally hits the Balls-Plex but Mil Clown barely kicks out of the pin. Irish whip by Candice but Mil Clown hits a hammerlock slam, Candice goes for a quick pin but Mil Clown reverses it. Mil Clutch α by Mil Clown, and she picks up the three count! Mil Clown wins! Saki Akai is perhaps the most famous Joshi wrestler under the DDT umbrella as she is also a model, she has been wrestling in DDT since 2013. This is her first match in Tokyo Joshi Pro since September, and she comes with a new helper – her maid Martha. Miyu is 21 years old and has also been wrestling for about three years, however she hasn’t wrestled outside of DDT/Tokyo Joshi Pro. She is one of TJP’s best wrestlers however and a former champion in the promotion, so I’m looking forward to seeing how she does in such a big match. Miyu anxiously charges at Saki to start and gets her into the ropes, but Saki switches positions with her before giving a mostly clean break. Miyu goes to run off the ropes but Saki pulls her down by the hair, Miyu gets Saki down in the corner however and chokes her with her boot. Saki returns with kicks of her own, but Miyu knees her in the stomach and hits a dropkick to the back. She goes off the ropes but Martha trips her from the apron, Miyu goes out to confront Martha but Saki kicks Miyu from the apron. Saki throws Miyu into the ring post, kick to the chest by Saki and she rolls Miyu back in. Irish whip by Saki and she elbows Miyu in the chest, kneedrop by Saki and she covers Miyu for two. Saki picks up Miyu but Miyu elbows her off, STO by Saki but Miyu kicks out of the pin. PK by Saki and she puts Miyu in a submission hold, but Miyu gets to the ropes for the break. Big boot by Saki in the corner but Miyu avoids the next one, she goes off the ropes but Saki kicks her in the stomach. Saki goes off the ropes but Miyu catches her with a lariat, leg sweep by Miyu and she hits a backbreaker for two. Sleeper by Miyu but Saki gets a foot on the bottom rope, they trade elbows and knees, kick to the head by Saki but Miyu fires back with a release German. Back fist by Saki but Miyu avoids the scissors kick and nails a heel kick of her own, picking up a two count. Miyu picks up Saki but Saki catches her kick, Miyu slides under her legs and she applies a chinlock, but Martha distracts the referee. Miyu goes to confront Martha, Saki comes over but she boots Martha in the face by accident. Jumping knee by Miyu in the corner, she hits a fireman’s carry slam but it gets a two count. Buzzsaw Kick by Miyu, she goes off the ropes but Saki avoids her charge and kicks her twice in the back of the head. High kicks by Saki, she nails the Two Step Face Kick and she gets the three count! Saki Akai is the winner. Our only title match of the evening, as this is the only championship belt in Tokyo Joshi Pro. While a lot of the undercard and midcard of Tokyo Joshi Pro shouldn’t be taken too seriously, Yuu and Syoko are both legit. Yuu debuted exactly a year ago but has impressed so much that she won the TOKYO Princess of Princess Championship on September 22nd, less than nine months into her career. This is the second defense of the title, as she defeated Rika Tatsumi on October 28th. Having such a young and inexperienced wrestler isn’t as odd as it sounds, as its a pretty new promotion so they don’t really have a veteran on their roster. Syoko debuted in 2013, the last time she faced off against Yuu was in the finals of the Tokyo Princess Cup last June, which saw Yuu come out the victor. Syoko can avenge that loss here, plus win the promotion’s title. Syoko also was in the main event of last year’s Korakuen Hall show, losing to Miyu Yamashita for the same title she challenges for today. Yuu gets Syoko to the mat first, she goes for Syoko’s arm but Syoko spins out of it. Yuu keeps Syoko down for several minutes but Syoko eventually gets top position. Yuu quickly regains the advantage, she puts Syoko in a grounded necklock but Syoko gets out of the hold and applies a headlock. Syoko trips Yuu and bridges back up, armdrag by Syoko and she avoids Yuu’s charge in the corner. Syoko slides out to the apron and snaps her neck over the second rope, she slides back in and puts Yuu in a figure four necklock. Syoko slides Yuu to the apron and slams her head onto the mat, Yuu gets back on the apron but Syoko kicks her as she does. Neckbreaker by Syoko, and she covers Yuu for two. Syoko goes off the ropes and hits a flipping neckbreaker, she picks up Yuu and trips her before driving Syoko into the mat head-first. Syoko applies a necklock but Yuu drives her into the corner to get out of it, Syoko goes for a headscissors but Yuu catches her and slams her to the mat. Running elbow by Yuu and she hangs Syoko in the corner, running elbow by Yuu and she covers Syoko for a two count. Sidewalk slam by Yuu, she picks up Syoko but Syoko slides away, she goes off the ropes but Yuu catches her and hits the Oklahoma Slam for two. Syoko goes off the ropes but Yuu swats away her dropkick, Yuu goes off the ropes but Syoko connects on her second try. Yuu falls out of the ring but Syoko dives out after her with a tope suicida. Syoko slides Yuu back in and elbows her in the corner, she bulldogs Yuu into the turnbuckles before going up top and hitting a missile dropkick for two. Syoko picks up Yuu and drives her face into the mat, double arm takedown by Syoko and she keeps it locked in for a submission. Yuu gets to the ropes for the break so Syoko puts her in a tarantula, she goes up top but Yuu chops her before she could jump off and judo throws her to the mat. Syoko goes for an elbow in the corner but Yuu catches her and spins Syoko down, John Woo by Yuu and she chops Syoko in the chest. Syoko elbows her back and they trade blows, Syoko goes for a dropkick but Yuu doesn’t budge. Yuu chops Syoko in the corner and flips Syoko to the mat before goes for the cross armbreaker. Syoko blocks it and hits a hurricanrana, Northern Lights Suplex by Syoko but it gets a two count. Syoko goes for a double arm DDT but Yuu back bodydrops out of it, she picks up Syoko but Syoko spins her to the mat and holds her down for two. Dropkick by Syoko and she goes for a Tiger Feint Kick, Yuu ducks it so she hits one under the second rope instead. Double arm DDT by Syoko, she picks up Yuu but Yuu hip tosses her to the mat and applies the cross armbreaker. Syoko gets a toe on the ropes to get the break, Yuu picks up Syoko and applies a Cobra Clutch. Yuu picks up Syoko and nails a Last Ride Powerbomb, and she gets the three count! Yuu is still the champion. Tokyo Joshi Pro is chock full of young talented wrestlers that just need more exposure and experience to really get them over the hump. Almost all their wrestlers are still young and have less than three years of experience, but some show a lot of skill for their level. Not all of their matches are catered to my personal taste, I am not a big fan of most types of comedy matches unless its done really well, but the top half of the card delivered. Mil Clown, Syoko Nakajima, and Miyu Yamashita are ones to keep an eye out for, as all looked great on this show. From top to bottom this was an enjoyable experience, nothing was bad (depending on your opinion on comedy matches) and some of the action was top notch. An easy recommendation for this big event from Tokyo Joshi Pro, some of their smaller shows are more hit and miss but this one delivered.